A novice is likely to be totally lost in the Rosencrantz and Guildenstern scenes, which become an extended insider joke in the fact that it doesn't matter who is playing which, so everybody plays them both. 32. Ian as Hamlet, Dayton, Ohio, 1994. As the four actors wallow in dirt, dog-pile wrestling on the representation of Ophelia's grave, it hit me that we were watching playground theater. The three-hour event plays like four kids staging Hamlet on monkey bars, benches, and sandbox. "You play Rosencrantz and I'll play Guildenstern"; "No, you play Rosencrantz and I'll play Guildenstern." Now children, everybody will get to play Rosencrantz and Guildenstern. In this metaphor, though, the "four kids" are supremely talented players who know their Shakespeare. 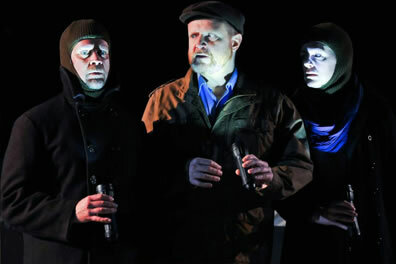 From left, Bernardo (Tom O'Keefe), Horatio (Edmund Lewis), and Marcellus (Andrus Nichols) carry flashlights as they await an appearance of the ghost on Elsinore's battlements in the Bedlam production of Hamlet at the Lynn Redgrave Theater. Photo by Jenny Anderson, Polk & Co. This four-actor presentation of Hamlet by Bedlam at New York's Lynn Redgrave Theater, an Off-Broadway 300-seat studio theater in which the whole room becomes the stage and the audience merely players, is not a great Hamlet, but it is great theater and could very well be the most fun version of William Shakespeare's magnum opus you will ever see. Bedlam's credo is theater "committed to the immediacy of the relationship between the actor and the audience." The project began with the other half of Bedlam's current Redgrave Theater repertoire, George Bernard Shaw's Saint Joan, and having brilliantly mastered that sprawling play as a foursome, the troupe seems to have adopted a "what else can we do?" audacity by taking on Hamlet. This is, therefore, a new way to see Hamlet but not necessarily appropriate for someone without theatrical experience of the play. A novice is likely to be totally lost in the Rosencrantz and Guildenstern scenes, which become an extended insider joke in the fact that it doesn't matter who is playing which, so everybody plays them both. The final scene is a shell game during which you have to watch the hats as well as the actors. Tom O'Keefe plays Claudius and Osric, the latter wearing a bowler; Edmund Lewis plays Laertes and Horatio, the latter wearing an Irish cap. As the climactic catastrophe unfolds, actors and hats move about at variable speeds. For all the intelligent subtlety O'Keefe brings to his Claudius, his catching Osric's hat, Frisbeed from across the stage, while in character transition is his most arresting moment of the production. Director Eric Tucker, who also plays Hamlet, proves his greatest worth at the helm in managing these theatrical nonconventions to maximum effect. The whole theater becomes the play space, and if that means making malleable the audience seating, so be it; for the first of two intermissions, members of the audience are instructed to pick up their belongings and exit to the lobby, and when we return, the seating configuration has changed. The opening scene is most effective, as Horatio, Barnardo, and Marcellus appear among us using flashlights in a totally dark theater. The ghost's second appearance, set up by the first, is a heart-attack moment for those of us who have paid for the "premium seats." [For a spoiler version of this review, click here.] The actor playing old Hamlet is Tucker, and he smoothly transitions into young Hamlet for the first court scene, which takes place among the audience—two of whom serve as the ambassadors. Part two of the production—from Rosencrantz and Guildenstern's entrance to Hamlet's exit for England—uses a totally different staging condition: four chairs in the center of the play space, and for the most part the four actors occupy those chairs throughout the action, transitioning physically and vocally from character to character. The other actors at times become props, and the Mousetrap gets a bit of help from stagehand/understudy Samantha Steinmetz doing the dumb show. Part three is played in the round, and a trashbag full of dirt is poured on the floor to represent Ophelia's grave. In the script, Laertes and Hamlet fight in Ophelia's grave, Claudius and Gertrude try to intervene, and Horatio and others pluck the two combatants asunder; in this production you get all four actors brawling in the dirt in an intertwining of limbs, lines, and characters (including a dead Ophelia). In casting parts, Tucker seems to have followed a thematic line. He is Hamlet and in the one instance Hamlet's father (the ghost's lines are spoken by the other three actors, interweaving their lines, making for a truly haunting "O horrible" echo). Andrus Nichols plays the two women as well as bit parts; Lewis switches back and forth between Laertes and Polonius, in addition to playing Horatio; O'Keefe pairs his Claudius with such servants as Osric and Reynaldo. And members of the audience, either by virtue of where they happen to be seated or selected by the crew, become characters, too. Since Lewis is playing both Polonius and his son, the father's famous precepts are delivered to a woman sitting in the seat next to him serving as Laertes's stand-in. At the end of the play, another young woman is handed a script to read the part of the English ambassador. The cast itself might be a clue to why Bedlam chose Hamlet for its follow-up effort to Saint Joan: Nichols played Gertrude in Shakespeare Forum's 2012 production of Hamlet (reviewed on Shakespeareances.com) and the title character in a 2010 We Players production on Alcatraz Island, and O'Keefe also played Claudius for the Shakespeare Forum. Tucker has played Hamlet and Laertes and has directed the play three times, including a production in Los Angeles starring William Hurt as the Ghost. Nichols and O'Keefe, in particular, bring a wealth of character understanding to their multiple parts. Nichols, a landmark Gertrude in her Forum performance, is this time a landmark Ophelia, playing her as a high-strung girl from the start, emotionally vulnerable and, consequently, already tottering on mental instability. As Laertes is departing, Nichols sheds real tears, forming water drops on the ground. By contrast, in her mad scenes she becomes surprisingly mature and emotionally controlled; king and court are as much scared of her as concerned for her. Nichols's Gertrude, meanwhile, might be lustfully in love with the handsome Claudius—they are ever embracing each other—but her chief concern is for her son. A doting mother, she is baffled by Hamlet's behavior in the closet scene, but when Claudius afterwards clearly shows a greater concern for political considerations than personal bonds (factoring in the fallout of Polonius's murder and contemplating the best way to handle Hamlet), Nichols's Gertrude begins displaying a distrust for her second husband. Hamlet (Eric Tucker) with his arm around Horatio and holding Osric's hat. Photo by Jenny Anderson, Polk & Co.
O'Keefe, in turn, introduces a key moment for Claudius in the graveyard scene. When Gertrude bemoans how she had hoped Ophelia would be her son's wife, O'Keefe's Claudius wraps his arms around the grieving queen and looks across the grave toward Laertes with an expression that says, "See, I told you his mother lives almost by his looks." This production also leaves in Claudius's confessional aside that comes well before the Mousetrap, and O'Keefe plays the duplicitous king adroitly. Tucker's Hamlet is the picture of irritation in the opening scene, a shaken bottle of cola awaiting the moment when he opens up and his anger spews out. His eyes issue a seething response to Claudius's announcement that Hamlet is next in line in succession to the crown: that Claudius stepped into the throne ahead of him clearly eats at Tucker's Hamlet. This sets his course for the remainder of the play. The rest is loudness. The subtleties Tucker starts with are subsequently subsumed in his tyrannous verse readings. He ends up yelling most of the soliloquies as if he were auditioning for Lear on the storm-drenched heath, and his relationship with the two women is exhibited in sexual violence. In the nunnery scene, he mounts Ophelia as he rails at his ex-girlfriend, and in the closet scene he thrusts himself upon Gertrude as he rails at his mother. In the former, it makes for powerfully emotional theater watching Nichols' Ophelia withstand the attack and end up forever shaken; in the latter, Gertrude gamely withstands the attack, but as Hamlet's behavior is by now growing tiresome we become more concerned with how Nichols the actress is holding up. But, as Hamlet carries out Polonius's body and she explains all to Claudius, Nichols again leaves us emotionally wrought, this time as Gertrude. Emotional investment, ultimately, is what any theater seeks to achieve. Bedlam is not really thinking outside the box with its staging but is simply turning the entirety of the box and every aspect of that box into its stage. The greatest fun of this show is watching how the company pulls it all off with just four actors, one stagehand, and members of the audience. Perhaps, you could argue, this makes the entire production one big gimmick. But not only do we become emotionally invested in some of the characters (whether or not we end up liking them, as Ophelia and Laertes, or disliking them, as Claudius and Hamlet himself), we become emotionally invested in the actors playing them. That is no gimmick: It's great theater.